French forces withdraw behind the Meuse river between Dinant and Sedan as advance German panzer columns push out from the Ardennes. 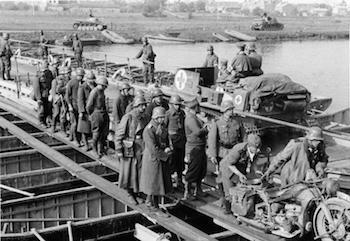 Germans troops continue their advance through Holland, crossing the Yssel and Meuse rivers at several points. Massive German artillery bombardments are maintained on western front, the Luftwaffe continues to reek havoc across Northern France and Belgium, causing refugees to stream west, clogging the roads for allied forces. Internment of Germans begins in Britain. A British convoy, codenamed ‘Tiger’, arrives at Alexandria with much needed tanks and aircraft. The first contingent of the US Eighth Army Air Force arrives in Britain. Timoshenko’s offensive grinds forward into Army Group South with two pincer attacks, one Northwest out of the Izyum bulge by the 6th Red Army and the other West then Southwest by the 28th Red Army from the Volchansk area, designed to converge west of Kharkov. The Red Army falls back towards Kerch in the Crimea. 800 bombers of the US 8th Air Force carry out attacks against the synthetic fuel plants at Leuna-Merseburg, LÃ¼tzkendorf, Zeitz and BrÃ¼x. Fierce German counter-attacks are put in by the German defenders at Monte Cassino. The remains of German Seventeenth Army in Crimea are destroyed, with the Russians taking 36,000 Axis troops prisoner. The Japanese attacks to the South East of Imphal are broken off. British relief troops land at St HÃ©lier in Jersey, to an ‘overwhelming’ welcome. General Vlasov, commander of the anti-Bolshevist Russian Liberation Army is handed over to the Russians by the Americans and will be executed for treason in August, 1946. Very heavy fighting continues on Okinawa, with 125 Japanese aircraft being reported as shot down.